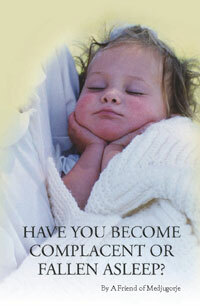 Have You Become Complacent or Fallen Asleep? It is almost beyond belief that in our world of fast food and fast living, Our Lady descends slowly and silently each day from Heaven to bless us and give direction for our lives. In the beginning, the apparitions were new, exciting, and wonderful to contemplate.But today, many have grown tired, lost touch, or fallen asleep altogether. Are you one of these? Do you want to remember why Medjugorje was once so important to you? Everything you need to re-ignite your conversion is in Our Lady’s messages. Read them. Meditate on them. Live them. Be renewed.